WASHINGTON (CNS) — For some aspiring priests and religious, the biggest obstacle to pursuing their vocation is student debt. Because many religious orders do not accept members with outstanding debts, 42 percent of individuals discerning religious life in the U.S. are barred from formation because of their student loans, according to the Laboure Society, a nonprofit that helps people in this situation raise funds to pay off their loans. According to multiple studies by the Center for Applied Research in the Apostolate at Georgetown University, one in three people seeking to enter religious life carries student debt, which on average amounts to about $28,000. For Andrew McCullough, an aspiring Dominican, that number was $20,000. McCullough studied mechanical engineering at the University of Washington in Seattle and moved to Washington, D.C., last fall to be near the Dominican community he hoped to join. The plan was to work off his loans for a year, then begin his novitiate this fall. After some difficulty finding a job, McCullough realized he would have to delay entry another year, until fall 2018. He currently sells insurance with State Farm, lives according to the Dominican rule for aspirants and joins the brothers for prayer when he can. “Something about (St. Thomas) Aquinas’ spirituality and his being both kind of a mystic and an intellectual, having a profound sanctity, a real profound holiness but also a great mind really attracted me” to the order, McCullough told CNS. McCullough said that until recently, the Dominicans’ Eastern province was able to take on a certain amount of student debt, but because of an influx in vocations, the province can no longer afford to pay off entrants’ loans. A 2012 study by CARA for the National Religious Vocation Conference found that seven in 10 of the religious communities where more than three aspirants had educational debt reported turning someone away because of debt. In the same study, 80 percent of those communities asked someone to delay their application because of debt. For this story, Catholic News Service reached out to every Catholic seminary and religious community in the Archdiocese of Washington to learn their policies on student debt. Most did not respond. Paulist Father Frank DeSiano, director of formation, told CNS that the Paulist Fathers will pay new members’ outstanding debt once they are ordained. A spokesman for the Jesuits’ Northeast province said that the Jesuits also are able to pay off entrants’ loans once they are ordained. For aspirants with greater debts, the Laboure Society’s intensive fundraising program can help individuals raise about $45,000 over six months. Aspirants are trained in ethical fundraising and strive to meet certain goals along with their classmates each week. In the end, each aspirant tries to raise the same amount, even if they owe more or less. Dominican Brother James Mary Ritch, an alumnus of the Laboure Society, owed $60,000 after earning his bachelor’s degree in biology and master’s in neuroscience. Brother Ritch said the weekly goal of 15 letters, 30 phone calls and five face-to-face meetings with donors was daunting at times. “It’s a difficult road, but it’s well worth it because it solidifies your commitment to the religious community, talking to various people from different backgrounds who say, ‘Wow, you’re going to raise that much money? That’s ridiculous! Why don’t you just get another job, or why don’t you work a few more years?’ But you want to give your life to the religious community rather than sticking it out for a few more years,” Brother Ritch said. He also mentioned that it would have been difficult for him to find a well-paying job quickly in his field, because research jobs require months of training. Brother Ritch took simple vows two years ago and is working this summer at the Franciscan Center, a soup kitchen in Baltimore. 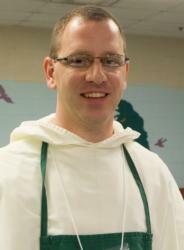 He takes courses at the Dominican House of Studies in Washington during the school year. The Laboure Society is currently making monthly payments on his student loans, and next year will pay off his loans in full.